Originally from Cincinnati Ohio and currently residing on the Gulf Coast in Pensacola, Fl. Sandy attended Kent State University and the University of Cincinnati. She furthered her education with design and art courses at Pensacola Junior College and The University of Alabama. Sandy's formal training, workshops, and experimentation has allowed her to create beautiful works of art. Influenced by nature, design, and color, she has achieved a unique style, that is solely her own. Sandy's hand signed prints, being offered for sale are high quality giclee reproductions of her original works of art. The subject of her paintings are often seascapes, wildlife or nature and more recently abstract. An unusual emphasis is placed on the colorful and textural background, which is a trademark of her style. Her paintings begin with an abstract representation in acrylic and are finished realistically with watercolors, acrylics or a combination of mediums. Utilizing a wide spectrum of colors and hues, Sandy's art is suitable for today's contemporary living and eclectic decorating. 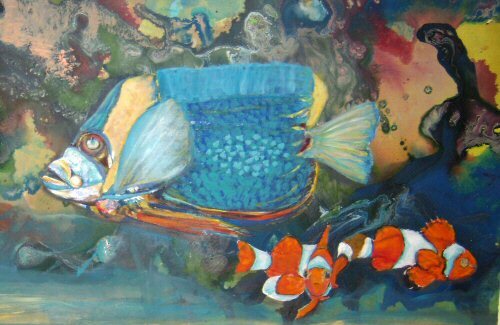 Sandy has painted and marketed coastal artwork to interior designers and businesses for many years. Thousands of Sandy's original giclee' prints are in private homes, exclusive condominiums, galleries and retail locations along the Gulf Coast.